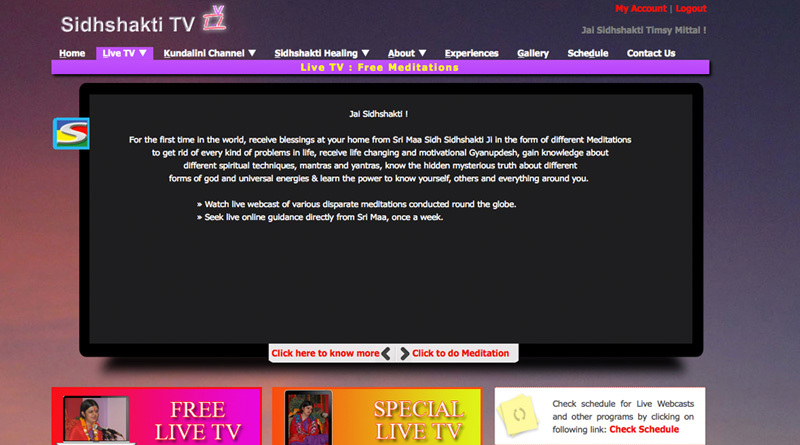 Sidhshakti.tv: The world is on the web, so are the solution to your problems. Sidhshakti.tv is a place where everybody wish to reach one day. A serene, calm….. a true dreamland, where you feel de-stressed, fulfill your worldly and spiritual desires. 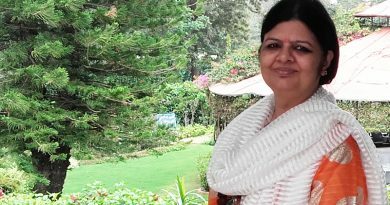 Sidhshakti.tv is a unique television website where you can render solution to your every problem through simple, quick yet powerful meditations and other divine natural techniques by Sri Maa Sidh Sidhshakti Ji. Param Pujya Divya Brahmnarayani Sri Maa Sidh Sidhshakti Ji is a blessing of the Supreme Power to this universe with one single purpose, to benefit the world with the divine energies. Sri Maa’s utmost motive is to spread happiness in every family, every society and every country of this universe. Sri Maa always extends Her Divine Love, Grace and Energy for the wellbeing of the poor, destitute, orphans, jail inmates, elderly and the public at large, with equality, to relieve them of all their troubles. Every Sidhshakti Meditation is for Jan-kalyan, “Public Welfare”. In early days, Lord Shiva gave the knowledge of Kundalini to Goddess Parvati. Saints and Gods like Rama used to live in Gurukul and learn everything about their Inner self and Kundalini. This is what spirituality is all about – “Knowing your own self”. 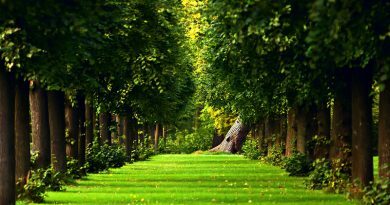 But, in today’s world, human beings know nothing about the five elements of nature, of what we are made. We don’t even know the divine universal fact that the energies of this whole universe reside in us. We can achieve all that we want, all that we desire. Gaining Riddhis & Siddhis are not impossible. But, all these supreme knowledge and the divine secrets cannot be learnt and gained without the real Guru. We feel lucky to have Sri Maa Sidh Sidhshakti Ji who always bestows upon us the Universal Energies & Supreme Gyan (Knowledge). Nothing is impossible under the guidance of Sri Maa. Sidhshakti Meditations are so special that people experience innumerous things which have happened for the first time in the world here. It is happening for the first time in the History of mankind, that people are being relieved of their hardest and strongest of Karmic Debts, Karmic Ties, Pitradoshas, Prarabdhas and other hurdles, by Sri Maa Sidh Sidhshakti Ji. Sri Maa’s pious place ‘Institute of Spiritual Sciences’, situated at A-38, Sharda Puri, Ramesh Nagar, New Delhi-110015, India, is the centre of all activities being conducted for public welfare. Sri Maa’s blessings can be received by doing the unique Sidhshakti Meditations on miraculous www.sidhshakti.tv as well. The uniqueness of Sidhshakti TV and Sidhshakti Meditations lies in the fact that it offers you solution through divine energies, which are being further Sidh by Sri Maa. Everything in this universe from electrons to galaxies exists because of the energies. Energy is the cause of creation and destruction in entire universe. So any solution sought through the medium of divine energies is unique. 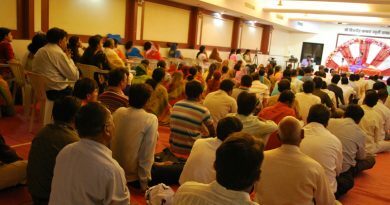 Considering the lifestyle of today’s generation, the duration of Sidhshakti Meditations are not more than 25 minutes. There are no restrictions in doing these meditations. One does not need to leave, sacrifice or give-up anything for doing Sidhshakti Meditations. One can follow the same lifestyle as one has been following. Moreover, one can do these meditations anytime, anywhere. There are no restrictions of having a bath or doing some kind of worshiping before doing Sidhshakti Meditations. All one needs to do is, to do these meditations with full devotion, utmost belief and submission. In Sri Maa’s loving Eyes, everyone, be they of any age, caste, creed, gender, educational background or status, are equal and can benefit from Her Divine grace without any bias or restrictions. When you browse through Sidhshakti.tv, you can solve every possible problem through meditations and different mantras here. Since it’s a web world, and people love to live in their own comfort zone; the Sidhshakti.tv is thoughtfully designed so that one can view their desired meditation at their own suitable time. There are channels like Live Channel, 24×7 Channel, On-Demand Channel, Kundalini Channel, Sidhshakti Healing Channel, Experiences Channel etc. These self-explanatory terms are more than enough to excite anyone to explore Sidhshakti.tv, where the universe lies. Yes, it’s a whole universe in itself. All you need to do is collect all your faith, reverence and dedication and travel the spiritual world you have never seen, heard and experienced before. Browse through this unique television and experience the divine supernatural energies flowing in your body, through your nadis, through chakras, reaching your conscious, sub-conscious, un-conscious mind and opening all seven doors of your body.